The new folder can have any name you want (in this case it´s “XYZ”) and you need to add this string to the folder name (including the point). When done, the symbol of the folder will change and when you double click it, you have everything you want in one big folder. This also works with Windows Vista but several crashes of the explorer have been reported, so use it only carefully. 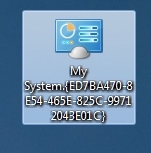 If you don´t want to mess up your desktop with a soo long folder name you can also create it in a subfolder on your desktop. But – some people reported crashes, so use it carefully.